Something to Hold by Katherine Schlick Noe. Review: Imagine living with people who are all different from you, people who don't like you very much and are cruel to you? Doesn't it sound a lot like Segregated America? 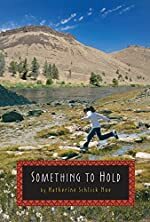 In the story Something to Hold by Katherine Schlick Noe, Kitty has just moved to the Warm Springs Reservation in Oregon. It's 1962 and her father works for the government. Because of his government job, Kitty's family moves from place to place constantly. During the time of Segregated America, African Americans were always treated unfairly by whites. In this story, Native Americans and whites are both being mistreated by each other; Native Americans because there are already fights going on between Native Americans and whites, and whites because there are very few whites living on the reservation. This is just one of the problems that Kitty and her family have to put up with in this story. The only reason why kitty's family is on the reservation in the first place is because kitty's dad is a fireman and they have to move from place to place depending on where the most fires are happening. This story is very appealing, especially because it is based on the author's childhood. I think that Katherine Schlick Noe did an amazing job in writing this book. Because of her history, she is able to add exceptional insight into the experiences of whites living on a reservation. Personally, I think this book is intended for older readers due to the concepts of the story. Many young children would probably not be able to understand the problems and the conflicts between Native Americans and whites in the story, whereas older children would understand. I would rate Something to Hold 5 out of 5stars because it can educate you on the past of native Americans and whites in America. I loved this book and I think that others would feel the same. Once you start reading this entrancing book, you won't be able to put it down! We would like to thank Houghton Mifflin Harcourt for providing a copy of Something to Hold for this review. Have you read Something to Hold? How would you rate it?